Sometimes the best things in life are the simplest and this is true many times when it comes to camp fire cooking. Yes, there are times that I want something fancier that will make the event or outing feel more special but there are other times I just want a delicious meal that does not have a lot of whistles and bangs to it. This is especially true when I do not want to be tied down to the chore of a lot of clean up after the meal. This simple Peasant Stew fits the bill. It is hardy, healthy, and full of delicious flavor. It does not take hours to fix and the ingredients are easy to find. In the scheme of life who could ask for more but a simple recipe to go with a simple life. Build the fire to prepare the coals. Begin the prep work by finely chopping the onion and mincing the garlic. Place a grilling rack above the fire. Prepare a 12 inch Dutch oven by spraying or wiping with liquid oil. Add the olive oil to the inside and place on grilling rack. Add prepared onion and garlic to the Dutch oven. Stir until onion is clear. Add tomato paste and vinegar and continue to cook until the mixture is slightly darkened. Please note not burnt. Pour tomatoes into Dutch oven. Drain and rinse chickpeas and put in Dutch oven. Prepare the broccoli rabe by first cleaning it by simply running water over it or placing it into a colander. Once cleaned and still damp, cut crosswise 1 inch thick. If you are using strong flavored greens, repeat this same process. Add broccoli rabe or greens along with 2 cups of water. Top the Dutch oven with its lid. Remove the grilling rack and place 12 inch Dutch oven directly onto the coals. Top the lid with 22 coals. Cook for 15 to 20 minutes or until the broccoli rabe or greens are tender. 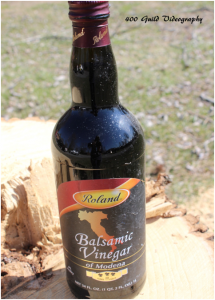 To serve, offer additional balsamic vinegar along with freshly ground parmesan cheese.